What if your destiny lay in the past? On their 25th birthday, twins Jill and Joanna Mason feel like life has passed them by. What they don’t know is that their adventures are just beginning. In Quivers and Quills, the sisters take their first journey to the past—Sherwood Forest, England, 1193. Jill invokes her inner action hero while Joanna discovers a talent for sleuthing. Their adventures continue in Gold Bars and Tin Stars when the sisters have a Wild West adventure in Arizona. 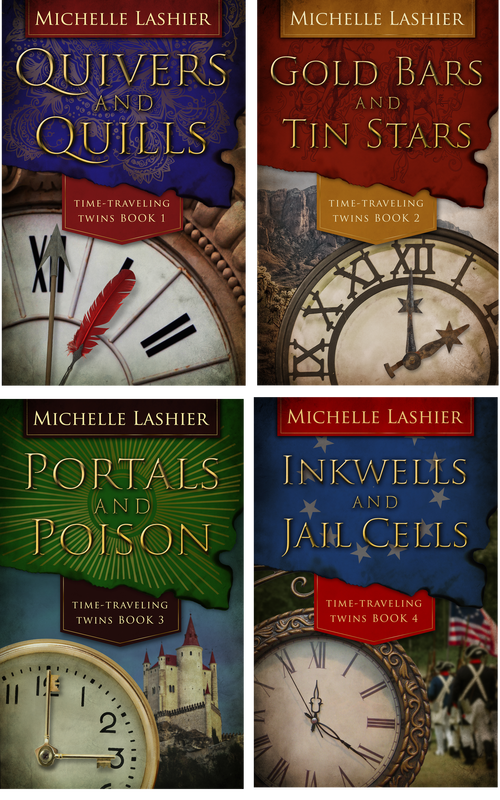 In Portals and Poison, the twins help an old friend in Europe whose life is threatened at the beginning of World War II. In Inkwells and Jail Cells, the twins meet their infamous ancestor Zachariah Mason and uncover secrets that threaten the Mason family in both the eighteenth and twenty-first centuries. This lighthearted adventure series focuses on strong women, competent men, and doing the right thing. The twins always counter lots of action, mysteries, plot twists, humor, and a bit of romance.